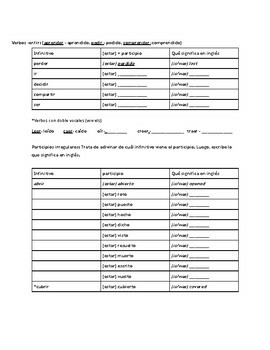 Help your students use their curiosity and observations to drive their learning of the use of participles with estar. This handout is meant to be done in class. Students read a section individually and form their own conclusions with one color (pen or pencil), then discuss with a partner their answers. After that, students are called on and the teacher reviews the correct answer. This continues until all sections have been covered. Students are immediately engaged in active learning and gain confidence as they intuit the pattern. Also, when they share with a partner they are explaining their reasoning and defending their conclusions which, as we know, leads to greater retention.